Before it was a financial center, a boomtown, a skyscraper city, Charlotte was a quiet collection of churches and cotton mills. 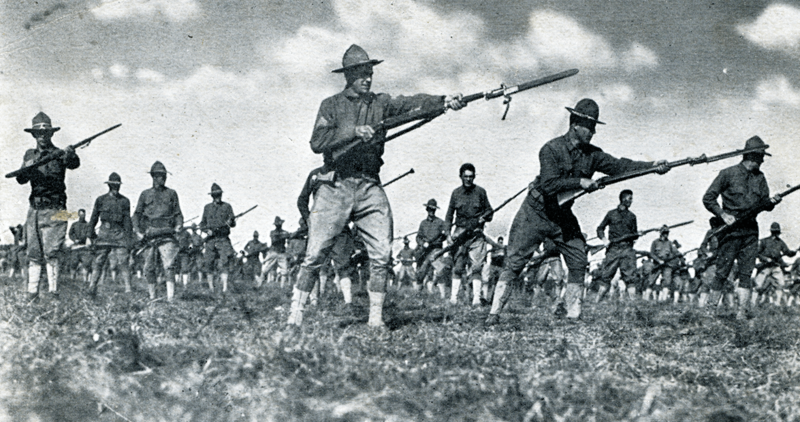 All of that changed during World War I, when the city played host to a military training camp. At 5:45 a.m., the bugler blares reveille, jolting soldiers from their slumber. After stumbling from their tents and barracks into the early morning, the recruits’ attention turns to war. Hand-to-hand combat. Target practice at the firing range. A drill instructor barking orders to infantry troops massed inside 8-foot-deep ditches, commanding them never to peek over the parapet, the earthen wall that shields them from snipers. A sudden burst of Springfield rifle fire overhead underscores the point. Three years into the war, fighting has reached a stalemate between the Central Powers and rival Allies along the Western Front. The Allies — Great Britain, France, Russia, and Italy — have blunted the Germans’ advances, but murderous artillery and chemical attacks stifle their counterattack. Both sides dig in, carving into European soil a network of trenches stretching 25,000 miles, by some estimates, in order to spare troops from certain annihilation. Desperate to break the deadlock, the Allies look to America. But when President Woodrow Wilson finally asks Congress for a declaration of war, America has only 100,000 full-time soldiers. Thousands more are needed to aid the Allied cause, and the Army needs boot camps to train them. In Charlotte, the business community is ambitious, and leaders like Chamber of Commerce President David Ovens see an opportunity. A boot camp means jobs, money, and prestige for this sleepy town dependent on agriculture and textiles. Landing one of the 32 facilities to be built across the country means Charlotte must beat in-state rivals Fayetteville and Wilmington, as well as Syracuse, New York, and Athens, Georgia. The Army deems Charlotte fit to host a training facility, and the camp is named for Nathanael Greene, the Continental Army major general who forced the British out of the Carolinas during the Revolutionary War. The camp takes just six weeks to erect, and, on September 6, the first troops arrive. 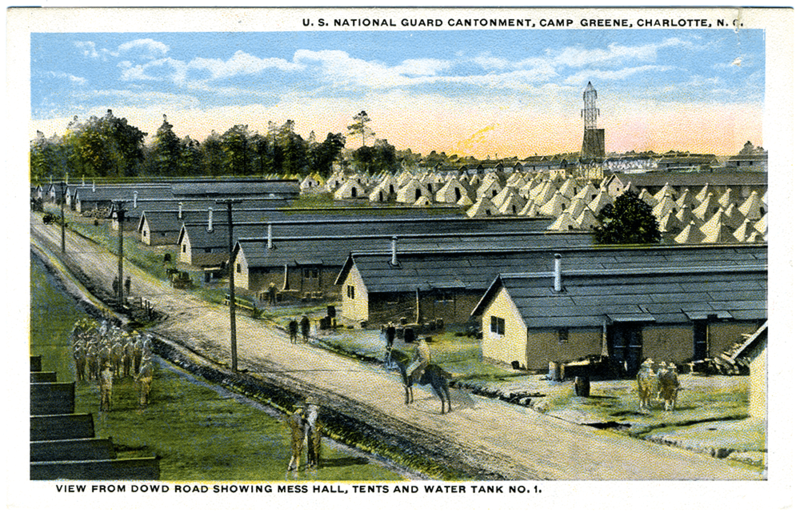 Camp Greene is a massive facility by early 20th-century standards. Its 2,500 acres of forest and cotton fields, bought from families like James Dowd, are eventually expanded to 6,000 acres, which stretch from the cusp of downtown, on what is now Wilkinson Boulevard, west to the Catawba River and Gaston County. There is plenty of room to dig five miles of trenches, to simulate the preferred method of ground combat in Europe. Shovels tear into the red soil, gouging ditches that crisscross Camp Greene at depths of up to 15 feet. Camp Greene becomes a city within a city: It has wooden barracks next to hundreds of multi-bed tents assembled in tidy rows, a bakery, a post office, and a 2,000-bed hospital complex, as well as a rifle range and an airfield. There’s room for traditional military assets, too: The base has a stable for horses and mules in their last major tour of duty in wartime as America transitions to tanks and trucks. At Camp Greene, soldiers prepare for the rigors of war. Drill instructors, whistles at the ready, teach hand-to-hand combat with the speed and accuracy of an uppercut punch to the chin and the deftly timed parry of an opponent’s bayonet. Nature also makes life and training difficult. The mild weather that was once a selling point for Charlotte becomes a distant memory in the first winter at Camp Greene, when heavy rains and snow make passage especially treacherous for men, beasts, and machines that struggle to navigate the red quagmire. Still, Camp Greene flourishes: At its peak, more than 60,000 soldiers live on base. The 41st Infantry Division, which trains for 16 weeks, is the first to ship off to France as part of the American Expeditionary Force, followed by the 3rd and 4th Divisions. Off the base, the soldiers are strangers in town, but Charlotteans eagerly embrace them with patriotic fervor. In the meantime, Charlotte rolls out the red carpet. Residents open their doors to the newcomers. New businesses spring up to provide goods and services, and established retailers like Belk Brothers cater to military customers. Wartime Saturdays prove to be especially busy for downtown merchants as civilians and soldiers crowd into stores to hunt for bargains. On Sundays, the city shuts down as soldiers worship at neighborhood churches, eat at parishioners’ homes, and court local women. Hotels and rooming houses fill to capacity. The YWCA opens a hostess house on the base, where soldiers can meet their wives, mothers, or girlfriends during off hours. “They would drop in to read and write and, on Sunday afternoon, to attend our informal vesper services, staying for the tea and wafers that were always served afterward,” Mrs. C.C. York, president of the Charlotte YWCA, tells the Observer. Even big league baseball pitches in by scheduling an exhibition game between the Boston Braves and New York Yankees on April 9, 1918. When the armistice ends hostilities on November 11, 1918, Camp Greene is already in the process of disappearing. Even as the Paris Symphony Orchestra performs on the base on November 12, tents and barracks are being removed, trenches filled, and stables torn down as the land returns to civilian use. The only camp remnants that survive are the Dowd family’s farmhouse — now designated as a historic site — and a couple of rectangular barracks that are converted into permanent housing. Americans are eager for peace. David Ovens and the rest of the early Chamber of Commerce knew Camp Greene would be good for their city, but could they have foreseen the force that Charlotte would become? In the end, Camp Greene brings business and utilities, and it brings people. According to the 1910 census, 34,000 people called Charlotte home. By 1920, a year after the camp’s closure, the town’s population has swelled to 46,000. Even with the camp gone, its modern assets boost Charlotte’s expansion. Utilities installed for the Army are turned over to developers who build commercial properties. A rising tide of soldiers return home, others put down permanent roots where they’d trained, and new communities take root where cotton and tobacco once ruled. Many of the nearly 8,000 laborers who built Camp Greene remain to build neighborhoods like Ashley Park, Clanton Park, Enderly Park, Berry Hill, and Shopton. Electricity, water, and sewer services that once served the camp breathe new life into a rapidly expanding city. Farming gives way to entrepreneurs and financiers who cater to a growing middle class. A boomtown, inspired and confident, is born. White is editor in chief of The Charlotte Post and a correspondent for The Charlotte Observer.